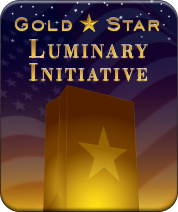 In 1936, President Franklin Delano Roosevelt declared the last Sunday in September Gold Star Mother's Day. This stemmed from a WWI tradition in which families of service members placed service flags in their windows, bearing blue stars for family members in active service and gold stars for family members who gave their lives for their country. Today we highlight the thoughts of one Gold Star Mom who lost her son in Afghanistan in 2009. The USMC is currently investigating how they are teaching recruits about the GI Bill education benefits they are eligible to receive. Survey results have shown that many recruits might be making the wrong choice in their selection of benefits. Information about this important news can be found here this week. Also, we have information on the start of a 13 year project commemorating the 50th anniversary of the Vietnam war, a reminder about our Luminary Initiative this Sunday, and a link to a useful OPSEC article on how to manage our online transactions to keep our Marines safe. We hold a Luminary Initiative every year on the last Sunday in September to honor mothers who have lost a son or daughter serving in the U.S. military. In communities big and small, organizations and individuals honor these women, from citywide events to a single luminary at the end of a driveway. Community service clubs, church groups and military organizations all participate - and they all need leaders, someone who will coordinate the day's activities, someone who will send out the call to action. Since its beginning in 2001, Operation Enduring Freedom has resulted in the deaths of over 2,000 Americans. Over 250 have died in 2012 alone. Yet, frequently we see references to apathy and "war-weariness" among the American public at large. One Gold Star Mother who lost her son in Afghanistan in 2009 recently wrote a letter to the editor of her local newspaper. 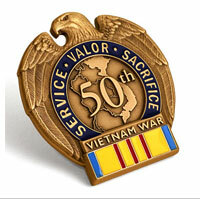 On Memorial day, 2012, President Obama issued a proclamation honoring the 50th anniversary of the military conflict in Vietnam. In discussing the proclamation, the president called on all Americans "to join us in thanking our Vietnam veterans in your communities." From the first major U.S. combat involvement in January 1962 through the fall of Saigon in April 1975, over 58,000 American lives were lost. At the peak of the conflict in 1969, over one-half million American soldiers were involved in the conflict, and over 1,600 Americans are still listed as missing even now, their fate unknown. One potential danger in the use of social media is the existence of fake profiles set up on various platforms to lure individuals into revealing sensitive information. It was reported recently that the Taliban have employed such tactics to befriend soldiers via facebook. In addition, many people are unaware of the dangers posed by geotagging, in which location information is invisibly embedded in uploaded files. In August of 2012, USAA printed an article titled 5 Social Networking Tips for Military Members. Please take time to read the article from USAA. The GI Bill provides educational benefits to military service members. New recruits typically must sign up during a brief window of opportunity for one of two possible options: the Montgomery GI Bill or the Post-9/11 GI Bill. While exceptions exist, in most cases the benefits offered in the newer Post-9/11 GI Bill are more favorable for the majority of recipients. 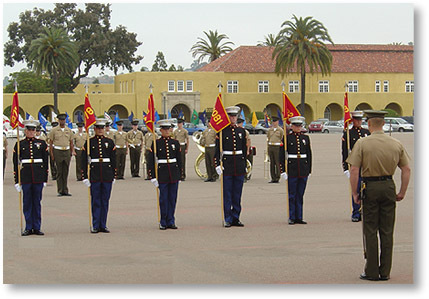 The Marine Corps has recently discovered that in 2012, more than 60% of recruits at Marine Corps Recruit Depot Parris Island, S.C. have opted for post-9/11 GI bill educational benefits, while less than 0.1% of recruits at Marine Corps Recruit Depot San Diego have chosen this option. An investigation is currently underway to determine what changes need to be made in training programs to make certain that recruits fully understand the options available to them. The banner photo is a Marine Corps photo taken 9/20/2012 By Cpl. Mark Garcia. Marines kneel down beside the battlefield cross to pay their final respects to Sgt. Bradley Atwell during a memorial ceremony, Sept. 20. During the ceremony, Marines paid tribute to Atwell, an aircraft electrical, instrument and flight control systems technician with Marine Aviation Logistics Squadron 16, from Kokomo, Ind. Atwell was killed in action while engaging insurgents during an attack on Camp Bastion, Sept. 14. OPSEC and social media: Marine Corps photo by Staff Sgt. Roman Yurek, 2/3/2011, Marine Corps Air Station Cherry Point.